Not following staircase regulation and safety can become very costly even in a domestic property. If you are looking to create a new staircase from scratch or renovate an existing one, it is important to consider all the rules and regulations about staircases before going ahead with such a project. It is vital first to check that all structural additions and changes to a property, big or small, adhere to all the current safety regulations so that (1) your staircase is functionally safe for all residents and visitors in the property, and (2) you avoid having to make any costly changes further down the line. If you are in doubt, we recommend that you consult a building inspector. They will be able to tell you in detail the requirements you will need to make to ensure your staircase is a safety feature as well as a design feature in your home. When it comes to renovating your stairs or any questions that you might have regarding your project, let Blueprint Joinery help you or at least point you in the right direction. Phone us on (01691) 671020 or email us at info@blueprintjoinery.co.uk. General access (a semi-public staircase such as flats, offices and factories that serve more than one dwelling). This basic guide will focus on domestic use only. Building regulations stipulate that all staircase steps should be level. Building Regulations BS8300 and BS9266 state that the tread should measure between 50-65mm, riser 30-55mm and nosing overlap of at least 16mm. All steps must have the same rise. For example, if you have a 200mm riser for the first two steps, you will, therefore, require 200mm risers throughout. It is against the safety regulations and a serious fall risk to have multiple rises; 200mm for the first two steps, and a mixture of 205mm and 210mm for the rest. 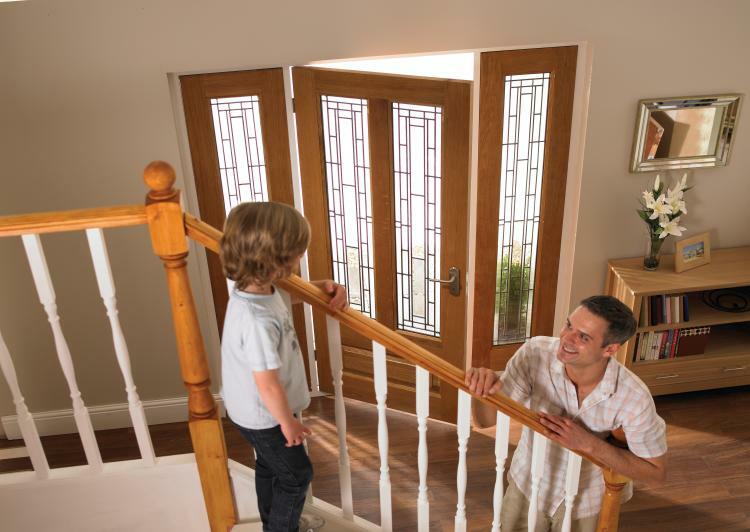 For a private staircase, you are allowed a max rise of 220mm and a minimum going of 220mm. Other types of property may differ. Also, it is important to note the relationship between the rise and the going; regulations state "Twice the individual rise plus the going (2R +G) must be between 500mm and 700mm." The maximum pitch of a domestic staircase should be no more than 42°. If there are more than 36 steps on a domestic flight of stairs, there should be a change of direction of at least 30°. There are no rules on the minimum width of a staircase, but standard flights measure 860mm, and for the main staircase it is agreed that a width of between 800mm and 900mm works and looks the best. Regulations state that a headroom of at least 2 metres is required throughout the staircase area. A landing section must be present at the top and bottom of every flight of stairs. In all cases, landings need to be clear of permanent obstructions, and doors should not swing open any closer than 400mm onto the front step. All landings should be level, except the ground floor which can have a gradient no greater than 1:20. We get asked all the time whether a handrail is even needed. The simple answer is yes. If your staircase is less than one metre wide, you will need at least one handrail present. If your stairs are wider than one metre, a handrail must be existing on both sides of the staircase. Please also note, the maximum amount of steps you can have before you need a handrail is two. U.K. building regulations stipulate that the handrail height should be between 900mm and 1000mm measured from the pitch line to the top of the handrail. Spacing stair spindles can be a difficult task when planning a new stair renovation. It is important that the spacing is correct to ensure, 1) a secure balustrade and 2) a safe journey up and down the stairs and 3) that your balustrade adheres to the latest building regulations. Building regulations state that a 100mm sphere cannot pass through an opening on the stairs including spaces between the spindles. For more information on stair spindle spacing, please check out our guide here. If you are unsure, please don’t hesitate to contact us either by email info@blueprintjoinery.co.uk or phone (01691) 671020. A member of our team will be more than happy to help you plan your stair renovation including what products you will need and a quote.